Kuala Lumpur's City Centre is the traditional heart of Malaysia's capital city in terms of administration as well as trade and commerce. The City Centre comprises the former colonial administrative district just west of the confluence of the Klang and Gombak River, where Kuala Lumpur was founded. At the heart of the colonial district is Merdeka Square, where Malaysia's independence was declared. Surrounding the square are many other colonial-era buildings. To the west of the square lies the pretty Lake Gardens while to the south you'll find the National Mosque, the Moorish-style Kuala Lumpur railway station, and several museums including the Islamic Arts Museum and the National Museum. To the east of the Klang river lies the old commercial district of Kuala Lumpur. You will find the iconic Central Markets, or Pasar Seni, of Kuala Lumpur and the narrow streets of Chinatown, with traditional Chinese shops, markets, eateries and budget accommodation galore. Although the old pre-World War II shophouses are quickly disappearing and being replaced with modern buildings, the area is still fascinating enough for a wonder. View of the Pasar Seni LRT and underground MRT station. The City Centre is easily accessible by rail, with two LRT lines, one MRT line and a KTM Komuter station serving the district. The LRT stations serving the City Centre include KJ14 SBK16 Pasar Seni and AG7 SP7 KJ13 Masjid Jamek of the Kelana Jaya LRT line or AG8 SP8 Plaza Rakyat and Masjid Jamek for the Ampang LRT line. The newest MRT Sungai Buloh-Kajang Line serving the Merdeka (interchangable with Plaza Rakyat) and Pasar Seni. If you're coming from KL Sentral, the main transportation hub of Kuala Lumpur in Brickfields, then take the Kelana Jaya LRT line. For easy access to Chinatown and the Central Market take the LRT or MRT to Plaza Rakyat/Merdeka and Pasar Seni stations whilst for easy access to Merdeka Square and the surrounding area use Masjid Jamek. If heading towards the City Centre from the suburbs, your best option is to catch the KTM Komuter, alighting at KA01 Kuala Lumpur Station (not to be confused with KL Sentral). Kuala Lumpur Station is a bit more south of the LRT stations. Don't let this discourage you as the old colonial Kuala Lumpur Station is an attraction in itself and is a good option to access attractions like the National Mosque or Lake Gardens. Almost all bus routes start and end in the City Centre. The main bus terminals are Pasaraman Kota (or the Klang Bus Station), Terminal Sultan Mohamed or Pasar Seni (opposite Pasarama Kota), Kotaraya (Jalan Tun Tan Cheng Lock), Bangkok Bank (Jalan Tun H.S. Lee), Sinar Kota (Jalan Tun Tan Siew Sin, formerly Jalan Silang) and Puduraya. Some routes, especially those by RapidKL, may end at the outskirts of the City, such as at KL Sentral or Titiwangsa. You'll be able to catch connecting City Shuttles from this terminal into the City Centre. See Kuala Lumpur's Get Around section for route details. 3.148906101.6959611 Masjid Jamek (Jamek Mosque). It's at the convergence of the Klang and Gombak rivers. The stately Masjid Jamek, constructed in 1909, is one of the oldest mosques in the city. Inspired by Mogul mosques in North India, this building's notable features are three elegant domes which used to dominate the KL skyline long before skyscrapers were built there. Its location between two rivers makes it appear as an island of tranquility in the busy city. Major construction work is ongoing due to the River of Life program, which is going to turn this area including the river into a prime recreational hotspot of the city. 3.14881101.693592 Merdeka Square (Dataran Merdeka). This square has a special place in the hearts of all Malaysians as it was here that the Union Jack was lowered for last time in 1957 and Malaysia gained her independence. Standing tall here is also one of the tallest flag poles in the world, measuring in at 100 m. Surrounding the area are host of historical structures like Sultan Abdul Samad building (see below) and the Old City Hall. The Royal Selangor Club and St. Mary's Cathedral are two famous landmarks nearby. 3.148611101.6944443 Sultan Abdul Samad Building. Built as the offices of the Colonial Secretariat, they later served as the first administrative centre of the Malayan government. Built in 1897 by British architects, A C Norman and A B Hubback, this historical landmark is famed for its Islamic-inspired architecture. Today, it houses the Courts of Law. The 40-m-high clock tower is a popular gathering-point for New Year and National Day countdown celebrations and parades. 3.139444101.6933334 Kuala Lumpur Railway Station. A Moorish-style masterpiece designed by Arthur Benison Hubback, a British Architectural Assistant to the Director of Public Works. As well as suburban trains and express trains to Ipoh, it houses a mini-museum of Malaysian railway history. It is one of three grand British-built railway stations on the Malayan railway network; the other two being Ipoh and the now-disused Tanjong Pagar Railway Station in Singapore. Fun fact: The construction was delayed as its rooftop design did not meet British railway specifications. It had to be able to support snow a metre deep. 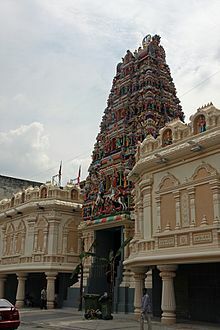 3.1434101.696495 Sri Maha Mariamman Temple, Jalan Tun HS Lee. An elaborate Hindu temple known as the starting point of the yearly Thaipusam pilgrimage to the Batu Caves, where Hindu devotees haul portable altars pierced to their skin with 108 lances. Check out the elaborate gopuram above the entrance. Free (but donations welcome). 3.13927101.704998 Al-Bukhari Foundation Mosque (Masjid Yayasan Al-Bukhari), 1, Jalan Hang Tuah (Close to Hang Tuah monorail/MRT station), ☎ +60 3-9221 0554. Beautiful mosque well worth a visit. 3.14162101.700739 PNB 118. If you like massive skyscrapers check out the construction site of the future highest building in Malaysia. 3.14435101.697651 Petaling Street (Chee Cheong Kai) (Near Pasar Seni LRT station). A relatively tame area during the day that comes alive in the evenings with stalls selling fake handbags, shoes, watches, sunglasses, DVDs and other various items. Be sure to haggle furiously as many stalls will inflate the price significantly. Along with sellers hawking their goods are restaurants and food stalls lining the street who will attempt to entice you in, sometimes a little aggressively. It can get particularly busy in the evenings so be sure to keep hold of your valuables. 3.145833101.6955562 Central Market (Pasar Seni), Cnr Jl Hang Kasturi & Jl Tun Tan Cheng Lock (Near Pasar Seni LRT station), ☎ +60 3 2031-0399. Market Building 10AM-10PM, Kasturi Walk 10:30AM-10:30PM. Kuala Lumpur's grand old market which opened in 1888 as a wet market, but has since been refurbished and has arguably lost some of its old charm, complete with air-con. The market is now aimed squarely at tourists and selling crafts, fabrics, jewelry and other trinkets, both local and foreign. A market street that runs parallel to the markets, called Kasturi Walk, also operates as part of the market. You will be able to find some of the most interesting places to eat at reasonable prices in this district. Chinatown is the place to head to for Chinese food while Lebuh Ampang just north of Chinatown is the place for Indian food. There are also the usual fastfood outlets like McDonald's and KFC. Lai Foong, 138 Jalan Tun HS Lee (corner of Jalan Tun Tan Cheng Lock and Jalan Tun HS Lee), ☎ +60 3 2072 8123. A classic Chinese coffeeshop with stalls offering a range of items. The beef noodles here is renowned throughout KL. Other items available include chicken and roast pork rice, prawn noodles and wantan mee. 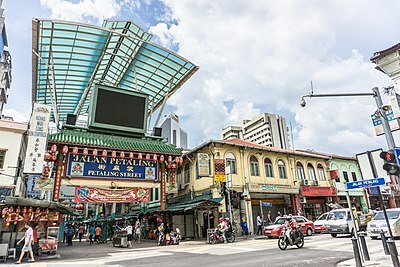 Soong Kee, 3 Jalan Tun Siew Sin (at the intersection with Jalan Tun Tan Siew Sin (formerly Jalan Silang) and Jalan Tun H.S. Lee) - This is a well-known KL beef noodle shop, it is said to have started operating since 1945. It serves the noodles "dry" with beef mince while the beef balls are given separately in a bowl of soup. Kam Lin Kee (金莲記), (corner of Jalan Petaling and Jalan Hang Lekir, opp Hong Leong Bank) No English sign, no menu in any language, and a kitchen you really don't want to look into - but it packs the crowds for its famous hokkien mee (fried noodles in dark sauce, RM5). Wash it down with a RM1 mug of cooling liang teh and soak in the busy market ambience. Lebuh Ampang banana leaf rice - The street is lined with banana leaf rice shops, just make your pick. One of them is Lakshmi Villas. For purely vegetarian food, you can try Bakti Woodlands. Restoran Vinni Jeyaa, Jalan Sultan Mohammed (in the middle of Jalan Sultan Mohammed, next to the Pasar Seni RapidKL Station). typical Indian restaurant (as for Malaysia) but with exceptionaly wide choice of Indian delicacies (both veg and non-veg). Very friendly staff and budget prices - full meal with drinks for two = around RM13. Indian Restaurant in the Kuala Lumpur Old Train Station next to Jalan Sultan Hishamuddin. Prices and service similar as in Restoran Vinni Jeyaa. [dead link] Viaggio Italian Restaurant (Viaggio Italian Restaurant), Lot 243, Jalan Sultan (Chinatown) (Walking distance from Chinatown), ☎ +60 3 2031 6888. Daily 7AM-11PM. Pizzas, pasta dishes are on the menu. Spacious, contemporary with open-concept kitchen. Open for breakfast, lunch and dinner or for snacks. There is little nightlife in this part of Kuala Lumpur, as most of the bars and clubs are in the Golden Triangle. San Francisco Coffee Express, LG-022 Lower Ground Floor, City Square Mall, ☎ +60 3 2284 7732. M-F 8AM-11PM, Sa Su 8AM-midnight. Hot and cold coffee beverages and delicious cakes of all kinds. [dead link] Reggae Bar, 158, Ground Floor, Jalan Tun H.S. Lee (on the edge of the Jalan Petaling night market), ☎ +60 3 2026 7690. Popular drinking hole for backpackers. They also serve Asian and Western food. Some of the cheapest accommodation within Kuala Lumpur is found in Chinatown and the surrounding area, but keep in mind that you tend to get what you pay for. The cheapest guesthouses are mostly rented by the hour and are rife with health and safety hazards, so are best avoided. For more upscale accommodation, see Golden Triangle instead; and if you're looking for hotels around the KL Sentral station, see Brickfields. 3.1415318101.69716861 Hostel Travel Hub, 15-1 Jalan Balai Polis (Behind The Traffic Police HQ), ☎ +60 123902339, e-mail: hello@travelhubkl.com. Check-in: 1PM, check-out: noon. Run by a friendly Sri Lankan family. Full A/C and breakfast included with free Wi-Fi and no curfews. Clean, very safe and basic. RM25-90. 3.1402648101.69343075 Heritage Hotel, Bangunan Stesen Keretapi, Jalan Sultan Hishamuddin, ☎ +60 3 2273 5588, fax: +60 3 2273 7566. This place might have shut down! Please check and update. Housed in KL's beautiful old railway station, one stop from KL Sentral. With breakfast. Varying standard of condition and cleanliness throughout, Wi-Fi in the lobby. Bad online ratings. Backpacker packages from RM18. Full hotel rooms start at RM60. Walk-in prices are around RM85. Oasis Guest House, Upper Floor 125 Jl Petaling. (Across the street from the Petaling Street Market). Rooftop terrace, TV/chill area. RM15 for dorm, RM25 for single w/fan, RM50 for single with A/C. [dead link] Monkee Inn, 48 Jalan Sultan, ☎ +60 3 2072 4229, fax: +60 3 2072 4271, e-mail: reservation@monkee-inn.com. RM25-80, private rooms from RM50-80. My City Hotel, 118-120A, Jl Petaling, ☎ +60 3 2026 6288. 5-min walk from the Pasar Seni train station, and a short train ride from the Kuala Lumpur City Centre (KLCC). Travellers Home Moon Lodge, No. 23 & 25 Jalan Tun Tan Siew Sin (formerly Jalan Silang) (Near Mydin), ☎ +60 320316873, +60 320313556. Cheap, simple, central, no bed bugs, no hot water. Ideal for budget travellers. Rooms from RM30. The 5 Elements Hotel, Lot 243, Jl Sultan (Chinatown) (Walking distance from Chinatown), ☎ +60 3 2031 6888. Check-in: 2PM, check-out: noon. Boutique hotel inspired by traditional Wu Xing (五行) philosophy. Here, water, wood, fire, earth and metal set the theme. Citin Hotel Masjid Jamek, Lot No. 7, Seksyen 33, Jl Melayu, Off Jalan Masjid India (1-min walk to Masjid Jamek Station), ☎ +60 3 2693 2999, fax: +60 3 2693 2988, e-mail: enquiry@citinmj.com. Check-in: 2PM, check-out: noon. New hotel near Little India. Rooms are simple and comfortable yet fun and trendy. A/C, 22" LCD TV, free wifi and ensuite bathroom. Cafe and room service though operating hours are limited. From RM115 depending on time of year. Hotel Chinatown 2, 70-72 Jalan Petaling, ☎ +60 3 2145 9599 (general), +60 3 2145 2593 (reservation). Popular with foreigners. At night it may be noisy like all hotels on this street (centre of the Chinatown night market). Comfortable, generic rooms. Service is not friendly, but highly professional and efficient. Room with window and A/C RM100. D’Oriental Inn Chinatown, 82-84, Jl Petaling, ☎ +60 3 2273 9999. Quiet and comfortable. Midah Hotel, ☎ +60 3 2273 9999. 8, Jl. Kampung Attap. 10-min walk to China Town. Heritage Internet & IT, Kota Raya Complex, Jalan Tun Tan Cheng Lock (5th Floor), ☎ +60 3-2022 0770. GTN Internet Cafe, 119 Jalan Sultan. This district travel guide to Central is a usable article. It has information for getting in as well as some complete entries for restaurants and hotels. An adventurous person could use this article, but please feel free to improve it by editing the page.